The 8 oz jar is quite large, enough for several handfuls. This is brand new stock just received from Thailand from Aroy-D. Quality is excellent. These are highly sought after among restaurants who prefer fried Thai shallots for the excellent bold flavor. 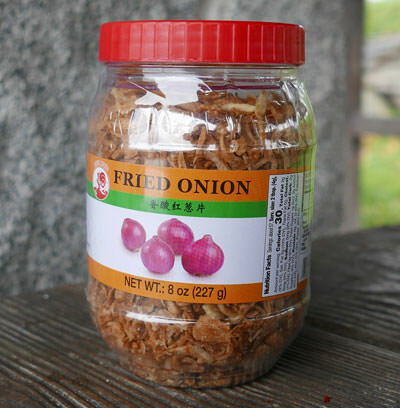 Ingredients: red onion 88%, palm oil 12%. We also offer Fresh Shallots. and Thai Fried Garlic. There are a few variants to this dish. Here we make it in a fancy way, which requires added time and cooking. A more basic version can be found here. You can also prepare the identical sauce and add it to a fried egg, then it will be called "Father in law egg".